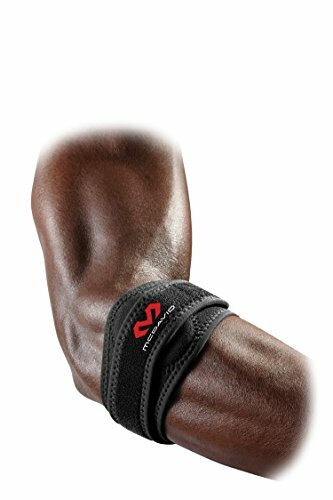 For anyone with tennis elbow, tendinitis, or just occasional pain, finding a reliable tennis elbow strap can be hugely important. That’s especially true if you’re someone who plays the game regularly. Tennis elbow is essentially a soft tissue injury that affects the elbow joint. But even those who don’t have the condition may experience elbow discomfort from time to time. 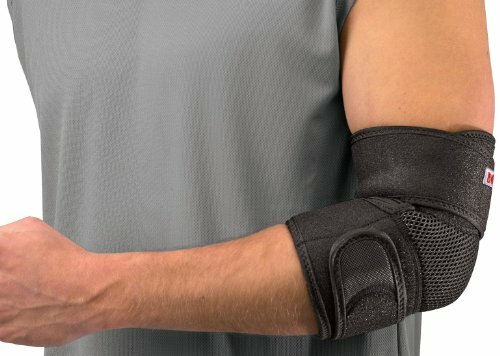 Before turning to expensive physical therapy or anti-inflammatory medication, try easing the problem with a good elbow strap, brace, or support for your elbow. 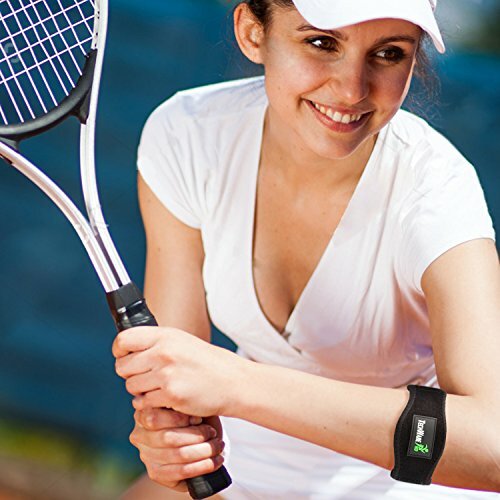 Investing in a tennis elbow strap is a good idea even if you’re not in constant pain. Take the time to browse through the different products available and select one that works for you. Here are some of the best tennis elbow supports to feel healthier again when you play. The Mueller is one of the better adjustable supports you can get. It’s very easy to put on, with a single Velcro strap to secure it in place. There’s almost no risk of it coming off during play. The sleeve is quite lightweight and is made out of a soft material that is comfortable throughout a hot day of matches. Even better, it doesn’t detract from the range of motion your elbow has, which makes it great for competitive play. The Mueller support features a mesh panel at the elbow so there is ventilation for the joint when you’re hitting your power shots. Mueller also makes one of our top-rated tennis knee braces if you’re in the market for one of those as well. The PlayActive brace comes in a pack of two for a very affordable price. Unlike the Mueller, this one isn’t a full brace that surrounds the elbow. Instead, it’s a strap that you wear on your forearm muscle. The soft compression pad is meant to ease discomfort that occurs when you grip your racquet. At just over two ounces, the PlayActive brace is super lightweight so you’ll barely even notice it while playing. The Velcro is very effective at strapping the brace in place. The strap may look simple, but it can make a big difference and since it’s cheap, there’s no risk in trying it out. This forearm elbow strap from TechWare comes with a guarantee—you get a full refund if you don’t notice improvement. Within the first 60 days after purchase, you can contact the company for a refund. 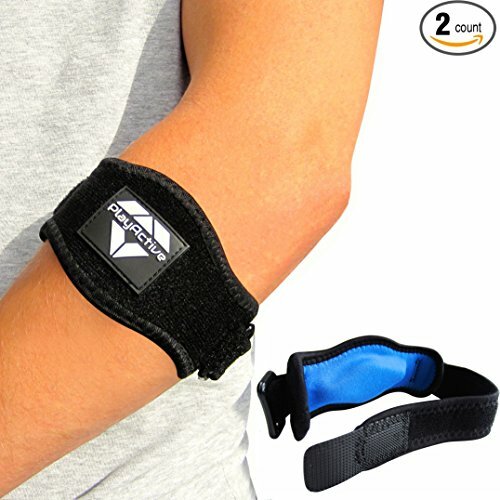 Like the PlayActive, this brace comes in a two-pack and is designed to be worn on the forearm. A compression pad is also present that uses EVA gel to provide instant pain relief as well as prevent repetitive strain injury. This strap also has the benefit of having wider Velcro straps than normal, but it’s still comfortable and not at all bulky. McDavid is a familiar and reputable name to anyone who has purchased knee or elbow braces before, so you know immediately that you’re getting a quality product. This elbow strap features dual pads for maximum comfort and pain relief. The strap is secured with an extra hook and loop that doesn’t come off easily. This and the special flat seam in the design makes it far more comfortable than a typical strap. Unlike some of the other products in this article, which are one-size-fits-all, the McDavid strap comes in three sizes, ensuring that you get the best fit for your arm. 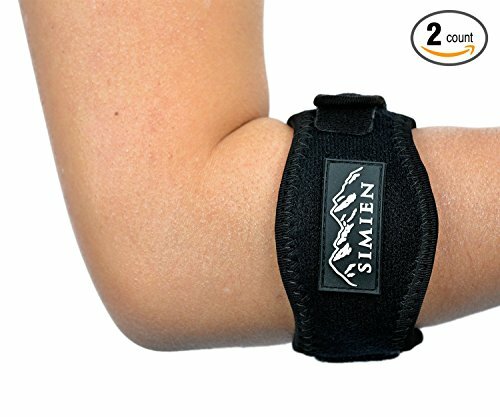 Simien’s neoprene and nylon forearm strap earns high marks for its versatility and comfort. People who play tennis regularly need a strap that can hold up to extended periods of wear, and this one fits that description. It comes in a two-pack so you won’t need to buy another strap for a long time after purchasing this one. The Simien adds something that the other straps don’t – a bonus ebook called “Addressing Tennis Elbow Pain.” The book offers tips and information for how to manage elbow conditions and provides additional online resources. The Elbow Sleeve Package from Fittest Pro includes a standard elbow sleeve, a soft wrap, and a typical strap. For those who aren’t sure whether to buy a brace or a strap, this is a good option because you can use them together or try each one out separately to find out which is most effective for your particular injury. The Fittest Pro elbow pack is extremely affordable, so you may wonder if there’s a catch. We haven’t been able to find one. Users report that the products are made from durable material and they work to provide pain relief just like the more expensive braces. 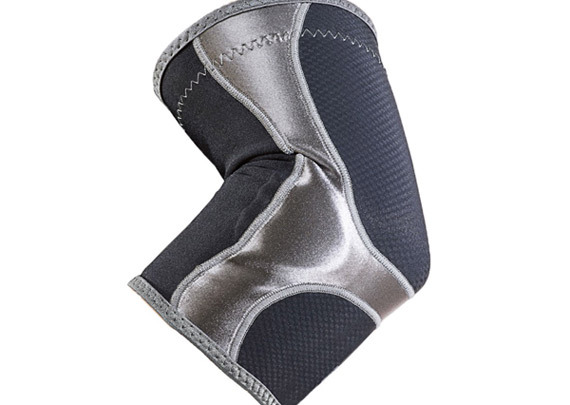 Here’s another full elbow sleeve for tennis players who aren’t satisfied with just a brace. 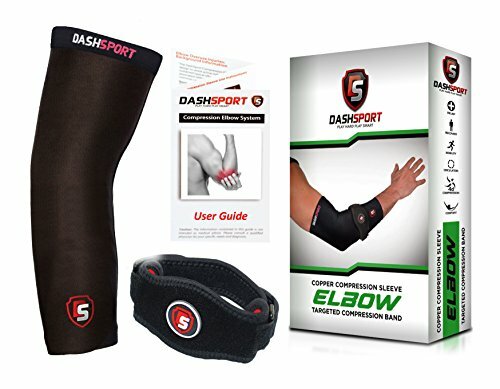 Actually, the DashSport package comes with both a sleeve (choose one of five sizes) and a brace, so you can try them individually or together to see which provides the best pain relief. A special non-slip design on this sleeve means that it won’t be affected by all the sweat in the world. It is made out of a special copper-nylon fabric that prevents odors and gives ventilation. It comes with a detailed user guide to ensure you won’t be guessing about precisely how to place the sleeve. Whether you have tennis elbow, tendinitis, or just occasional pain, a tennis elbow strap, support or brace may be just what you need to be able to perform at your highest level without discomfort. Grab one of these, get back on the court and take down your opponents!